WASHINGTON (AP) -- Energy Secretary Rick Perry's keynote speech at the World Gas Conference in June opened with a marching band and ended with an exhibition by the Harlem Globetrotters. It was a spectacle befitting the industry symposium. "We're sharing our energy bounty with the world," Perry gushed from a stage at the Washington Convention Center. Long undervalued, natural gas was once burned off indiscriminately as an unwanted byproduct of oil drilling. But the fuel's fortunes have changed. Cooled to minus 162 degrees Celsius, natural gas condenses into a liquid marketed as a clean alternative to coal. In just three years, the U.S. has emerged as a top producer of liquefied natural gas, or LNG, selling shiploads of the commodity to countries such as China, which are seeking low-carbon energy sources to combat climate change. Natural gas, it turns out, isn't so great for the climate, but that hasn't stopped America from sending its fossil fuels abroad. Since Donald Trump took office in 2017, exports of LNG and crude oil have surged, rivaling the likes of Saudi Arabia and Russia. To achieve what it calls "energy dominance," the Trump administration has taken its cues from an unlikely source: its predecessor. When Perry hawked LNG and coal to India in April, he was advancing a dialogue the Department of Energy began under Barack Obama in 2014. Leaked administration plans for a "central institution" to promote "clean and advanced fossil fuels" abroad could combine several Obama-era initiatives. Compared to Trump, Obama is regarded as an environmental champion. But history paints a more complicated picture. As the young senator promised "change we can believe in" during the 2008 presidential campaign, change was also sweeping American oilfields. Advances in hydraulic fracturing, or fracking — a way of recovering oil and gas from tight rock called shale — created a glut. Industry responded by pitching fossil-fuel exports as a "win-win" that would benefit consumers and enhance American power. Helping to deliver the message was a coalition of White House advisers: academics such as Columbia University's Jason Bordoff, energy gurus such as Daniel Yergin, and national-security experts such as John Deutch — all with links to firms profiting from the boom. Leading the charge within government was then-Energy Secretary Ernest Moniz, a nuclear physicist with longstanding ties to the oil and gas industry and an enthusiastic proponent of natural gas. Under his watch, the Energy Department moved swiftly to foster LNG exports in 2013 before shifting its focus to decades-old restrictions on the export of crude oil. Days after the Paris climate agreement was reached in 2015, Obama signed a budget bill to keep the federal government running; slipped inside was a provision allowing crude oil to be sold freely for the first time since 1975. The move was praised by an alliance of 16 companies, most of which are now capitalizing on an export-driven boom in the Permian Basin of Texas and New Mexico. What's good for corporate profits, however, may not be good for the planet. A growing body of research suggests natural gas isn't the climate panacea many promised it would be, with mounting concerns over its main component: methane, a greenhouse gas roughly 86 times more potent in the short term than carbon dioxide. In the race for energy supremacy, the U.S. has become not only the world's largest natural-gas producer but also a top exporter of oil — a fuel that remains among the most harmful for the climate and public health. As energy exports climb, so too does global consumption of fossil fuels, drawing billions in infrastructure investment that — some argue — tilts the world away from renewable sources of energy such as wind and solar. This story is part of a collaboration between the Center for Public Integrity, the Texas Tribune, The Associated Press and Newsy. As Obama's energy czar, Moniz spearheaded the administration's "all-of-the-above" policy, which endorsed drilling alongside renewable energy. When he became secretary in 2013, among his top priorities was fast-tracking approvals for natural-gas exports — as advocated by industry lobbying groups such as the American Petroleum Institute. The Trump White House has taken the idea a step further. In August, the Energy Department announced it would automatically approve small-volume exports of LNG. Interior Secretary Ryan Zinke, a booster of increased drilling on federal lands and offshore, has called America's energy supremacy a moral imperative. Moniz, now in the private sector, has continued to follow an "all-of-the-above" approach. His Washington office houses his nonprofit think tank, Energy Futures Initiatives, and his for-profit firm, EJM Associates LLC. The two organizations were launched on the same day last year. EJM receives staff and administrative support from EFI. Both share an office with The Scowcroft Group, a consultancy founded by former National Security Advisor Brent Scowcroft that specializes in emerging markets like China and whose clients include oil and gas companies. Scowcroft and Moniz aren't just office mates. According to their websites, their for-profit firms are engaged in a three-way partnership with McLarty Associates, a trade consultancy located in the same building. A press release describes EJM as a strategic energy advisor for McLarty Associates clients. Headed by Thomas F. "Mack" McLarty III, a Clinton White House official and former natural-gas executive, the firm has represented LNG investors Chevron and General Electric. McLarty's lobbying division has advocated for Shell on natural-gas matters and a company behind a pipeline with ties to the Kremlin. Brent Scowcroft and Mack McLarty sit on EFI's advisory board. During a recent interview with the Center for Public Integrity and Newsy, Moniz balked at the suggestion that his ties to the fossil-fuel industry could pose a conflict of interest. He emphasized his climate credentials, saying, "I have been a champion of renewables for a long, long time." Responding to follow-up questions, a spokesman wrote in a seven-page statement that Moniz "has no financial relationships with oil and gas producers," and that neither EFI nor EJM engages in "lobbying activities or foreign government representation." It also said, "EJM has had no discussions with McLarty on LNG export issues," but did not include a similar qualification for The Scowcroft Group. "To date, there are no joint projects with either (Scowcroft or McLarty)," the statement added. Representatives of Scowcroft and McLarty declined to comment. Moniz's oil-and-gas ties go back years. When named energy secretary, he terminated his work as a paid consultant for companies such as BP. At MIT, Moniz ran a think tank, largely funded by the oil and gas industry, which published one of the earliest and most influential reports on natural gas. First publicized in interim form in June 2010, it affirmed the fuel as a "bridge" to ease the country's transition from coal. The study's major sponsor was the American Clean Skies Foundation, a group created by Aubrey McClendon — then CEO of Chesapeake Energy — as part of a multimillion-dollar effort to market natural gas as a climate solution. Moniz and several co-authors aggressively promoted it. In his statement, Moniz's spokesman said the study has "stood the test of time" and emphasized Moniz's support for an Obama-era rule that sought to rein in leaks of methane from oil and gas sites. That regulation has become the latest target of the Trump administration. The MIT study was cited in a slew of other reports, including one from an Energy Department committee in 2011. Chairing the committee was John Deutch, a former CIA director and then-board member of Cheniere, a Houston-based company that later became the first to export LNG. Another member, author Daniel Yergin, went on to publish several studies in favor of LNG and crude-oil exports as vice chairman of IHS Markit, an industry consultancy. Yergin sat on the advisory board of Moniz's MIT think tank; Moniz was a private consultant for IHS Markit. Deutch did not respond to requests for comment, but a representative of Yergin's noted that IHS Markit is "solely responsible" for the contents of its studies, regardless of funding. The studies helped buoy the idea of natural gas as an answer to the planet's climate woes, even though early research hinted that methane could derail that narrative. A 2018 study sponsored by the Environmental Defense Fund — a green group that has partnered with the oil and gas industry to investigate leaks of the greenhouse gas — has only furthered doubts. 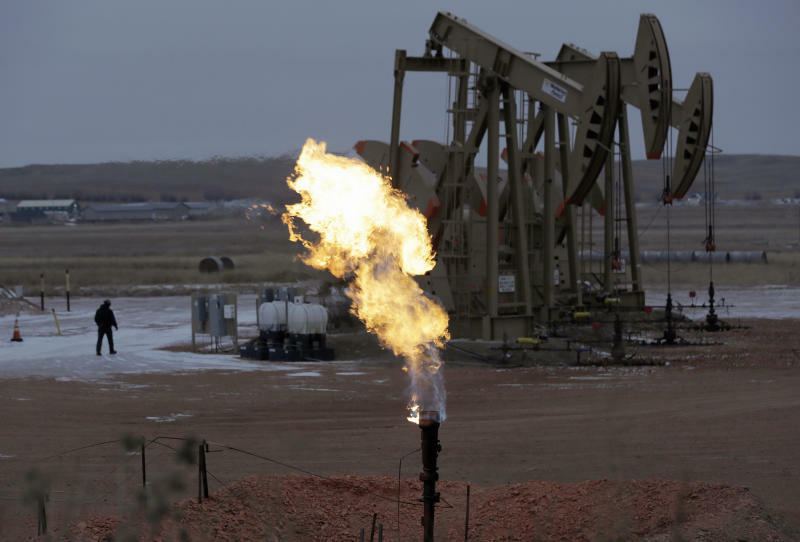 The study found methane emissions were 60 percent higher than previously estimated. "If natural gas is a bridge fuel," said Ramón Alvarez, a co-author and associate chief scientist at EDF, "methane leaks is a major structural fault in the integrity of that bridge." To meet the lofty targets outlined in the Paris agreement, it is widely accepted that countries must reach "zero emissions" by 2050, which means phasing out fossil fuels or developing technologies that make them climate-neutral. Environmentalists argue the expansive buildout of natural-gas infrastructure ensures the fuel's future for decades, jeopardizing the world's chances of avoiding catastrophic warming. During a July press conference in England with British Prime Minister Theresa May, Trump struck an upbeat tone. "We've become an oil exporter, which would not have happened under the past regime or a new regime if it weren't us," he declared. In fact, America did begin exporting large volumes of crude oil under Obama. He approved a last-minute budget deal to avert a government shutdown in 2015, which also removed restrictions on crude sales for the first time in 40 years. However, the country still imports more crude than it exports — a trend experts believe will continue. Congress had enacted the restrictions as a conservation measure in 1975 following the Arab Oil Embargo, which caused fuel shortages. Under the ban, companies had to refine crude oil into petroleum products such as gasoline or secure special exemptions from the Commerce Department to sell the resource abroad. As was the case with LNG, interest in crude exports soared when fracking took off. With oil production climbing steadily in 2012, American Petroleum Institute President Jack Gerard was among the first to suggest the ban be thrown out. Shortly thereafter, crude-oil exports became a priority for the GOP as well as some Democrats in drilling states. But they became an albatross for the Obama White House. Boosting crude oil — which doesn't have any of LNG's purported climate benefits — would put the administration at odds with its own climate agenda. So, in October 2015, the White House threatened to veto legislation lifting the ban, urging Congress to focus on "supporting our transition to a low-carbon economy." Senators Heidi Heitkamp, D-N.D., and Lisa Murkowski, R-Alaska, responded by mustering congressional support for a provision in that year's budget bill allowing crude-oil exports. By December 2015, the measure was part of a $1.1 trillion spending plan — veto-proof legislation needed to keep the federal government running. In exchange for backing exports, Democrats got five-year extensions on tax credits for wind and solar. "It didn't strike us as the best deal," said Ana Unruh Cohen, managing director of government affairs for the Natural Resources Defense Council, an environmental group. Cohen was an aide to Senator Edward Markey, D-Mass., when interest in the ban spiked on Capitol Hill. Markey was the deal's most vocal opponent, calling it a "Trojan horse" for "pumping up Big Oil's profits." Climate change was an afterthought in the debate over the ban, Cohen said. Both sides were fixated on how crude-oil exports would affect energy prices, not greenhouse-gas emissions. And Democrats mistakenly banked on emission-cutting policies such as the Clean Power Plan — one of several Obama-era regulations being tossed out by Trump — to drive investment in renewable energy. Even though the Obama White House publicly discouraged efforts to undo the ban, it ultimately signed off on the deal. Tyson Slocum, director of Public Citizen's energy program, called it a "pathetic compromise." On January 4, 2016, ConocoPhillips — one of 16 companies that collaborated to overturn the ban — became the first to export American crude oil. This summer, the U.S. shattered records by exporting 3 million barrels of crude a day, trailing only Saudi Arabia and Iraq. In a written statement, Heitkamp said crude-oil exports have allowed the U.S. to "level the playing field in the global energy market." Obama representatives did not respond to requests for comment. Moniz was among the first Obama administration officials to publicly question the ban, at an industry conference in December 2013. In the interview with the Center and Newsy, Moniz said his remarks reflected "proper policy," not energy-industry lobbying. Barriers to exports already had been eroding behind the scenes. In September 2013, the Commerce Department issued a confidential ruling allowing Houston-based Peaker Energy to export condensate, a barely processed, ultralight oil hard to distinguish from crude. The agency granted approvals to two more companies in March 2014.The rulings — which didn't become public knowledge until months after they were issued — triggered speculation by an energy expert that Commerce was taking a "baby step" toward lifting the ban. At the same time, a flurry of white papers promised crude-oil exports would not only lower energy prices but also give America an edge over energy titans such as Russia. One study from IHS Markit argued that reversing the ban would resolve a dilemma created by the fracking boom, which had flooded the market with a lighter type of crude that couldn't be easily processed by most U.S. refineries. Co-authored by Yergin, that report was funded by 20 oil and gas companies. Industry was also marshaling forces to overturn the ban. Producers for American Crude Oil Exports, or PACE, debuted in October 2014 as a coalition of 16 companies dedicated to reversing the "outdated policy in a new era of U.S. energy abundance." At least 14 of these companies were active last year in the Permian Basin, where exports have taken drilling to new heights. The Permian boom is expected to accelerate, worsening air quality and driving up water use in a region prone to drought. Some of the same PACE companies fund Columbia University's Center on Global Energy Policy, a think tank founded in 2013 by former Obama energy and climate advisor Jason Bordoff, who has argued in favor of both LNG and crude-oil exports as a way to spur job growth and keep America competitive. Of the 48 sponsors listed on the center's website, at least 29 have direct ties to the oil and gas industry. The center's board includes current and former executives from ConocoPhillips; Yergin; Chinese oil tycoon Fu Chengyu; and Charif Souki, co-founder of Cheniere and Tellurian. Only a handful of donors appear to be focused on climate change and renewable energy. The center declined to make Bordoff available for an interview. A Columbia spokesman wrote that the center's work has focused on "how the reduction of fossil fuel use and the growth of clean energy sources are necessary to address the urgent challenge of climate change. The suggestion that some contributions from commercial entities or any other source have affected the independence of (the center's) policy analysis is false." Bordoff has been a frequent critic of the Trump administration for its rollbacks of environmental regulations. But he's continued to advocate for LNG exports, aligning himself with free-market diehards like Perry. Slocum, of Public Citizen, said Trump administration officials are merely capitalizing on choices made years earlier that breathed new life into "vested fossil-fuel interests." "That's what folks in the Obama administration never really understood — that the decision they were making has implications for one or two generations," Slocum said. "That's the shortsightedness of this entire hysteria to promote exports."